In a study just published in the journal "Nature", an international team of researchers describes how an ocean current repeatedly strengthening and weakening again 60,000 to 12,000 years ago led to an extremely sudden change in the climate. 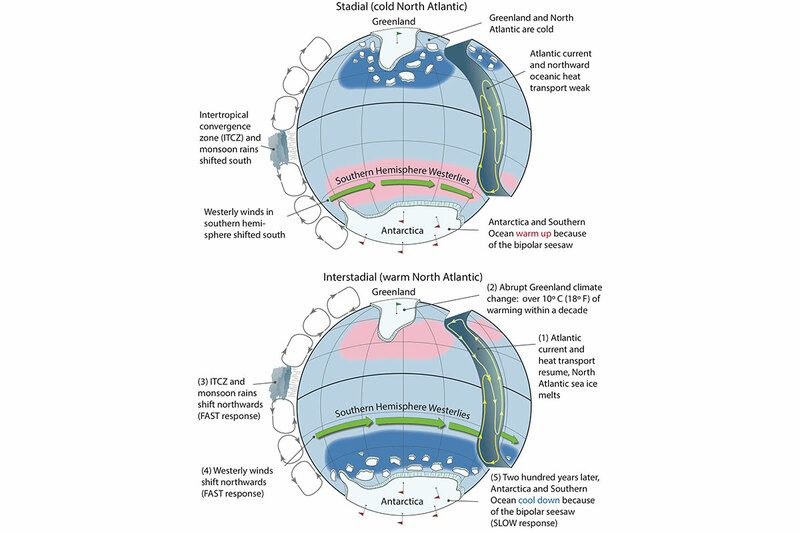 The current is known as the Atlantic Meridional Overturning Circulation (AMOC) and warms Greenland and Europe with the warm water that it sends into the North Atlantic with the Gulf Stream. 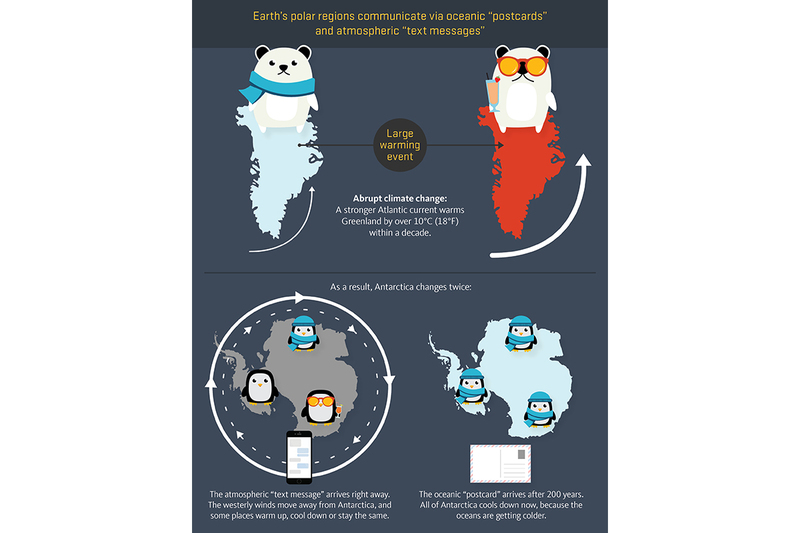 The new research findings show how these extreme events, also known as "Dansgaard-Oeschger Events", affect Antarctica at the other side of the world. "The North Atlantic sends messages to the Antarctic on two different timescales," explains the lead author of the study, Christo Buizert, a climate change specialist at Oregon State University (USA). He compares the atmospheric link to a text message that is received immediately. The ocean link, on the other hand, is apparently more like a postcard that takes a long time to reach its destination – in the case of the AMOC, 200 years. Michael Sigl, OCCR, University of Bern. During the last glacial period, the AMOC was normally very weak, and this created glacial conditions in the North Atlantic region. From time to time, however, the AMOC strengthened rapidly and significantly. As the international research team has discovered, this phenomenon caused a sudden rise in temperatures in Greenland. And when Greenland got warmer, the climate in the Antarctic also changed – in two ways. There was an immediate change in global atmospheric conditions, which led to a rise in temperatures in some parts of Antarctica and a fall in temperatures in others. The second type of change happened much more slowly. It was not until 200 years later that the drop in ocean temperatures in the northern hemisphere was mirrored in the Antarctic. 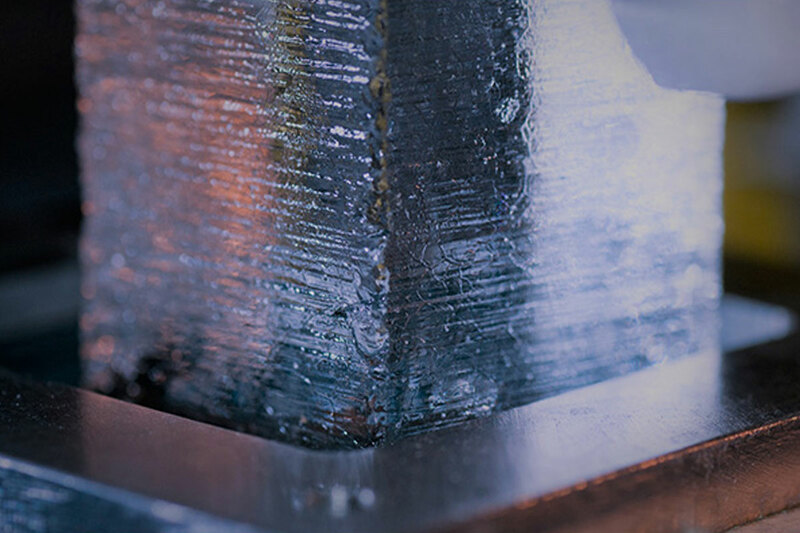 "Our study is the first to show in detail how the climate works over periods that extend far beyond those of meteorological observations", explains Michael Sigl, an environmental chemist at the OCCR. He worked on the study as an expert in the reconstruction of the earth’s volcanic past. 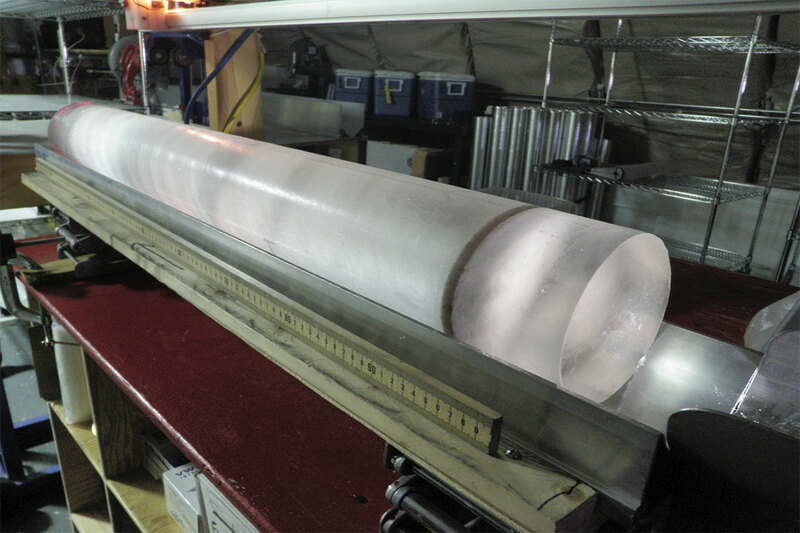 Nearly 1600 layers of volcanic deposits in ice were analyzed to synchronize the climate data for ice cores from five different locations in Antarctica. “It is only thanks to these geological horizons that we were able to put nearly 50,000 years of Antarctic climate history on a common timeline and compare it with the climate history of Greenland.” He adds that the reconstruction of Greenland’s climate shows that the region could warm up by 10 to 15 degrees within a decade once the Gulf Stream has reached its full strength. "This change is huge and sudden." In their study, the climate researchers were able to show that there are analogies between the climate of the past and current observational data. The atmospheric change in Antarctica follows a pattern of warmer and colder areas – a kind of temperature fingerprint. "Like detectives, we can compare these fingerprints in the ice with current wind patterns", explains Christo Buizert from Oregon State University. "Westerlies in the southern hemisphere and their influence on the sea ice around Antarctica are responsible for these temperature differences." Observational data and climate models show that the AMOC is currently weakening – a consequence of global climate change. This means that what happened during the last glacial period could recur: an abrupt change in the climate triggered by fluctuations in this ocean current. If this phenomenon is repeated, researchers fear that a weakening of the AMOC will probably reduce the strength of the Asian monsoons. Asia’s monsoon rains are fundamental to the livelihoods of billions of people. Changing wind patterns in the southern hemisphere will also affect the ocean’s ability to absorb carbon dioxide. This means that more CO2 emissions will remain in the atmosphere and increase the greenhouse gas effect. 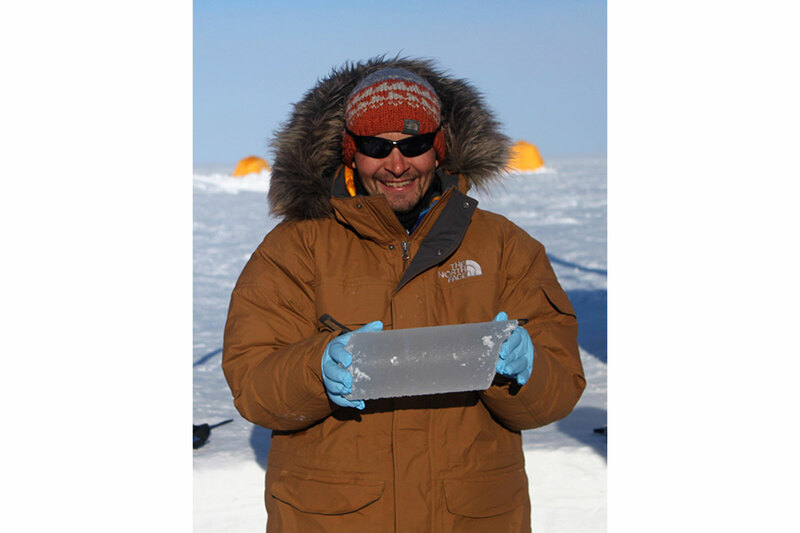 "The climatic connection between the North Atlantic and Antarctica that we proved still exists today," says Michael Sigl. "The reason for the current weakening in the AMOC is global warming and meltwater from Greenland. In other words, the atmospheric conditions are already starting to change as the text message is being sent just now." The "postcard" that will trigger changes in the oceans is, he says, also already on its way.